Which goes to show that the (free) digital proofing system isn’t always foolproof. One can always order a copy of a physical proof (for a small fee), but I would suggest this if you only have minor changes to make and have plenty of time before your publication date. One of the things I love about today’s self-publishing technology is the ability to do everything online. But in light of my friend’s comments, I’m thinking that for the next book, I may go for the physical proof to see how it really looks and feels in the hands. Which means that I will need to finish the book (including rewrites, extra eyes on it by my pre-publication reading group, cover design, etc) way before I plan to release it. Technology is both a blessing and a curse. Sometimes, it’s best to go analog in a digital world. My morning started out inauspiciously with an excruciating toothache at 3:30 am. It was so bad, I was calling on every deity I could think of for relief…and my generic Aleve had expired. *fights the air* I managed to find my last 800-mg Motrin tablet, and that plus an ice pack gave me enough relief to sleep. The morning looked up when my dentist’s office called and said they had a last-minute cancellation, and did I want to move up my afternoon appointment instead? YES, PLEASE! *happy dance* I was wondering how I was going to eat something, since food (courtesy of an abcess) made the area beneath a tooth throb mercilessly. Two hours, multiple x-rays, a teeth cleaning and a treatment later, I left the dentist’s office with a follow-up appointment for a deeper cleaning, and prescriptions for an antibiotic and painkillers. After dinner, I was quite thankful for the meds, which ended up being quite affordable. Obamacare FTW! Oh, and I also walked 3.5 miles today. Needless to say, I’ll probably tap out early tonight…I will try to stay awake for Graceland. Today was the pre-release of my first solo novel, The Bastille Family Chronicles: Camille (informally known as The Camille Chronicles). I’ve had a pretty positive response (and sales!) so far, for which I am grateful. I got teary-eyed when I saw that one of the purchases was from someone I haven’t been in touch with for over four years…yet he took the time to buy my book. I felt so loved at that moment. I’m also getting some buzz in various college alumni groups, sorority groups, and the like. Whee! Anyway, even though the official book release isn’t until August 4, I am already working on the next book in the series. I have lived and breathed Camille Bastille since November 2013 and, quite frankly, I’m tired of looking at her. 😀 Time to move on to another sibling; I already have drafts for two of them, plus a secondary character, so I will let my reading public decide which will be published next. I am also working on the stand-alone Bastille Family novel, which I started as part of Camp NaNoWriMo. And planning my upcoming book tour this fall. And keeping up with my exercise regimen. And taking naps. I’m excited, nervous, and glad. It’s been a long time coming…fourteen years, to be exact. The print copy will be available via CreateSpace/Amazon, and the e-book versions will be available in Kindle and NOOK. In honor of this momentous occasion, I’m giving my readers the opportunity to get a FREE autographed copy of The Camille Chronicles. You just pay shipping, and I will send it to you as soon as the book arrives to me from the printer. On the day of release, the regular price will be $14.95, no autographs. Or $16.96 plus s/h, if you want it autographed. If you’d like your FREE autographed copy (you just pay shipping), you can order securely here. Please make sure that you specify the proper shipping address, and how you’d like your name spelled. Please understand that this offer will ship after the August 4 release date. You have six (6) days to take advantage of this offer! **the listed shipping price is for USA orders only. If you are ordering from another country, please send me an email so that your shipping costs will be calculated accurately. Thank you all for following my brain droppings over the past couple of months and, as always, thanks for stopping by. Stay in the know–join my mailing list! Wanna keep up to date on my book releases, book events, exclusive content, and more? Make sure to sign up for my mailing list (and my Facebook page) HERE. In case you forgot, follow me on the interwebs: Facebook, Twitter, and Instagram. (well, it’s better than a bar!). How does that work, anyway? A forty-something neurosurgeon who is as beautiful as she is brilliant, and a Special Agent with the Drug Enforcement Administration who tends to talk in song lyrics? The Bastille Family Chronicles: Camille (which is informally known as The Camille Chronicles) is a story about a demographic that is usually overlooked within the contemporary romance genre: women (and men) of a certain age (40 years old and up). Instead of twenty-something, nubile young women without much life experience who hook up with thirty-something, world-weary men, The Camille Chronicles offers a different take on love and dating past your thirties. Set primarily in Baltimore, Maryland, The Camille Chronicles shows what happens when two people of two very different temperaments, from different backgrounds and vastly different professions, meet and sparks fly. See what happens when Camille Bastille, MD, a neurosurgeon from New Orleans meets Special Agent Andrew Paxson, a DEA agent from Chicago. To add a fun twist, the story incorporates the type of real music that is not often played on the radio anymore, and is usually relegated to Pandora, Spotify, or satellite radio. I’m talking Jodeci, Susan Tedeschi, Maxwell, Fleetwood Mac, Sly and the Family Stone, even The Sound of Music! Save your shekels this weekend, because the pre-sale of The Bastille Family Chronicles happens MONDAY, July 28. How cool is that? 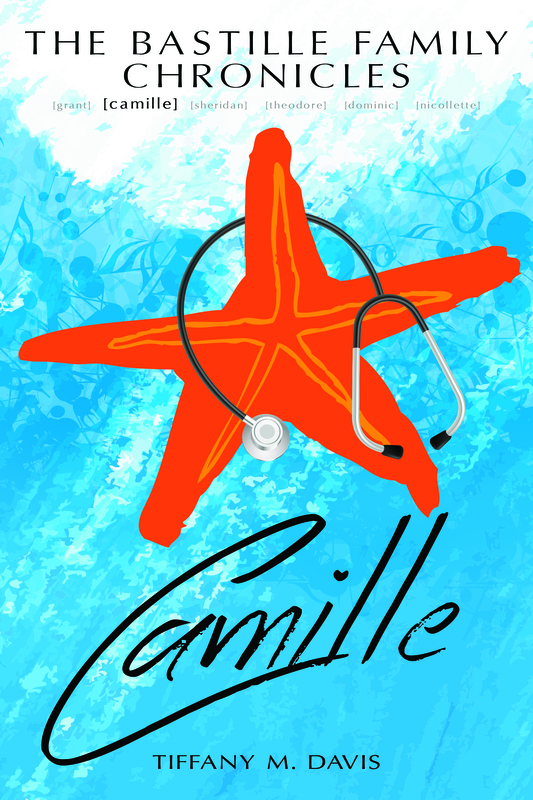 In case you missed it, learn a little about Dr. Camille Bastille and her five medical siblings in “Introducing the Bastilles“, a short story crafted especially for my readers. See you Monday, and thanks for stopping by. I am slightly sleep-deprived today, having nodded off around 10 p.m. last night only to wake up around 2 a.m. So I stayed up and wrote. And 2 a.m. turned into 5 a.m. A bowl of soup and one disgruntled cat later (he thought that, since I was awake, it was time for his breakfast. Nope–too early! ), I caught a few more hours of sleep before I awakened for the day. Since then, I worked on another campaign for my upcoming novel, The Bastille Family Chronicles: Camille, and ran some errands for my mom. As my late grandmother used to say, no rest for the weary!